Vientnamese protesters chant anti-China slogans in Hanoi, Vietnam, June 19, 2014. Last week Vietnam sent a senior official to China in a bid to ease simmering tensions caused by maritime territorial disputes in the South China Sea. Beijing and Hanoi have tried to mend ties three months after a Chinese oil rig was deployed off the coast of Vietnam, setting off deadly riots and straining ties between the two neighbors. A trip by a high-ranking member of Vietnam’s Communist Party to Beijing last week sparked speculation that the two countries are moving forward in efforts to smooth ties following months of heightened tensions. Le Hong Anh returned Wednesday from a two-day trip to China, where he met with Chinese President Xi Jinping. “A neighbor cannot be moved away and it is in the common interests of both sides to be friendly to each other," the official Chinese news agency Xinhua quoted Xi as saying at the meeting. Vietnam and China would continue to promote relations in the direction of “stable development”, Vietnam’s Ministry of Foreign Affairs spokesman Le Hai Binh said at a regular press briefing in Hanoi last week. He said the two sides would continue to improve cooperation in diplomacy, defense, security, economy, trade, law implementation and humanitarian issues. 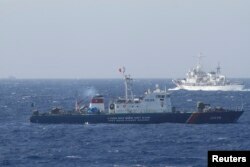 The May deployment of the Chinese oil rig, in waters also claimed by Vietnam, exacerbated a long-standing territorial dispute over islands in the South China Sea. The move triggered anti-China protests across Vietnam, which led to deadly riots in several industrial zones. China withdrew the platform on July 15 ahead of an oncoming typhoon. Anh’s visit was the first part of both sides “arm wrestling” over the issue, said Professor Carl Thayer from the University of New South Wales in Australia. "Anh’s visit has opened up channels. We’re seeing other lower level people explore what’s possible. China accepted the apology. We’re seeing both sides trying to overcome this but without conceding too much," said Carl. 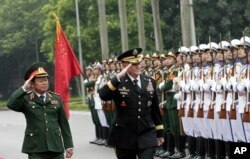 U.S. Chairman of the Joint Chiefs of Staff, Gen. Martin Dempsey, right, and Vietnamese Chief of General Staff of the Army, Lt. Gen. Do Ba Ty, review an honor guard in Hanoi, Vietnam, Aug. 14, 2014. Several high-level visits from the United States, including that of Gen. Martin Dempsey, Chairman of the Joint Chiefs of Staff, prompted speculation that Vietnam would seek closer ties with the United States as a bulwark against its giant neighbor. There has also been a visit from India’s External Affairs Minister, with President Pranab Mukherjee scheduled to visit Vietnam later this month. During a visit to Hanoi last month, U.S. Senator John McCain said he was confident of support in easing restrictions on the sale of lethal weapons to Vietnam. If this did go ahead, it would “symbolize a real change in the two countries’ relations”, said Vietnam expert Professor Jonathan London from City University, Hong Kong. "And thirdly and I think this shouldn’t be discounted is that Vietnam stands to gain considerably from U.S. intelligence and expertise and know-how with respect to maritime affairs," he said. Vietnam was trying to multilateralize as a way of “bargaining” against China, Thayer said. "China keeps warning them from moving too close to the U.S., but that doesn’t stop them from working towards Japan, which they have already done, and India if they are willing to play the game," said Thayer. While many have welcomed Anh’s visit to Beijing, the mood is still cautious. London said he believed no one in Vietnam thought things were where they should be between the two countries, and it was impossible to state with confidence that relations were on the mend. "After all, this was a representative not of Vietnam but of the General Secretary of the Communist Party of Vietnam, and the way that China operates as we’ve seen is say one thing and do another and Vietnamese are aware of this," said London. He said the fundamental aspect of Vietnam’s relationship with China was that discussions were conducted behind closed doors so it was impossible to ascertain where things really stood between the two countries.